The world harvested 250,191,362 metric tons (246,200,000 long tons; 275,800,000 short tons) of sugar beets in 2013. The world's largest producer was Russia, with a 39,321,161 metric tons (38,700,000 long tons; 43,300,000 short tons) harvest. The average yield of sugar beet crops worldwide was 58.2 tonnes per hectare. ↑ Beta Maritima: The Origin of Beets. Springer. 2012. ISBN 978-1-4614-0841-3. 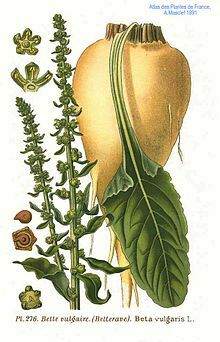 "The volume will be completely devoted to the sea beet, that is, the ancestor of all the cultivated beets. The wild plant, growing mainly on the shore of the Mediterranean Sea, remains very important as source of useful traits for beet breeding." ↑ ഉദ്ധരിച്ചതിൽ പിഴവ്: അസാധുവായ <ref> ടാഗ്; fao എന്ന അവലംബങ്ങൾക്ക് ടെക്സ്റ്റ് ഒന്നും കൊടുത്തിട്ടില്ല. ഈ താൾ അവസാനം തിരുത്തപ്പെട്ടത്: 17:17, 24 ജൂൺ 2018.